at the Soleil Vivarais campsite! As a family or with friends, holidays are often the opportunity to get together to share convivial times whilst having a drink or a good meal. 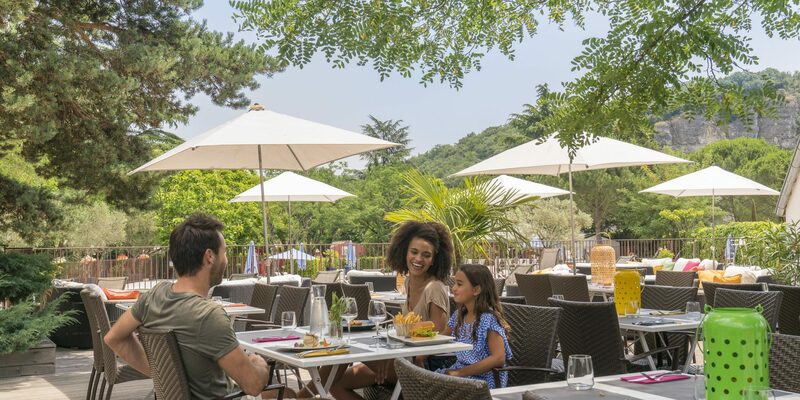 At the Soleil Vivarais campsite, we have indeed understood this and this is why we suggest that you sit down on the terrace of the restaurant “A l’ombre de…” to sample excellent tasty dishes prepared by our chef! 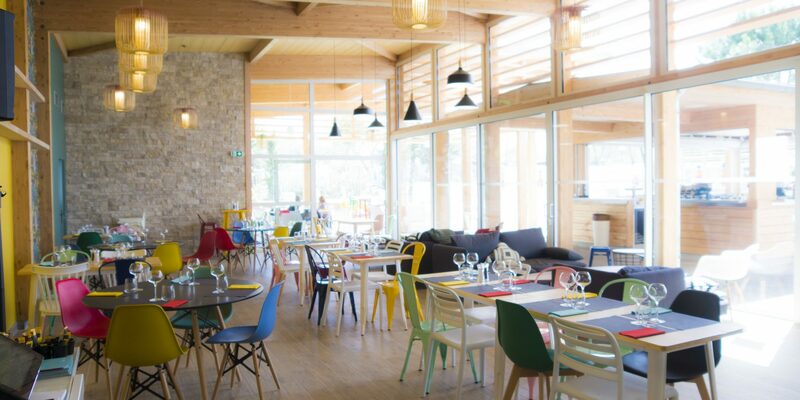 Located in the heart of the “La Rivière” area, close to the aquatic area, our 5-star campsite restaurant in the Ardèche “Ma Cantine Ardéchoise “ welcomes you every day. In the restaurant or on the shaded terrace, the chef and his team offer you delicious cuisine made up of seasonal ingredients. We have meat and grilled fish, mixed salads, wood fire oven-baked pizzas and dishes of the day served up to you in a relaxed atmosphere…all accompanied with a delightful regional wine list. Of course, children have not been forgotten. There is a menu especially for them, with everything that they like…We’ll leave you to guess on that one! During cooking, the chef has included small courses to prepare you for the delicious main dishes in the meal, made from fresh produce, for moments of self-indulgence. 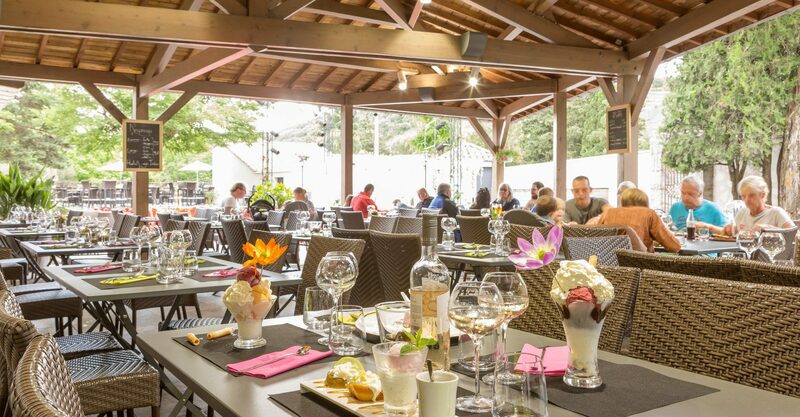 In particular discover the Ardèche abomasum, Beef Tartar as a burger, or even home-made chocolate mousse, prepared from Chauvet chocolate (the surname of the master chocolatier, Pierre Chauvet, in Aubenas). Genuinely fit for a king! Whether in the restaurant or on the shaded terrace, the restaurant team ensure that you have prompt and attentive service. All of this takes place in a relaxed, cheerful and holiday atmosphere. 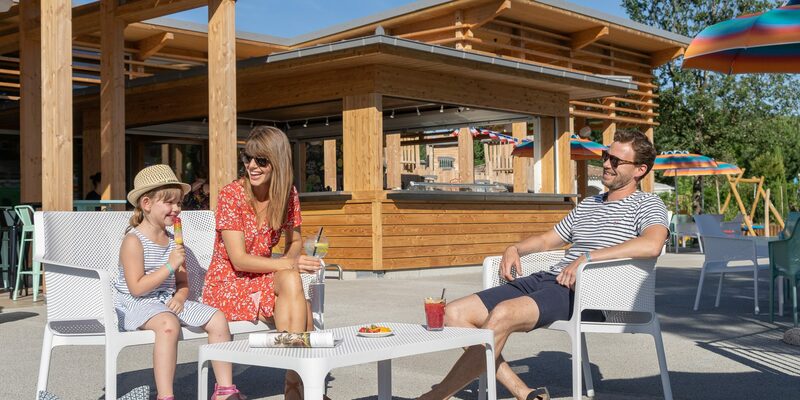 At midday or in the evening, the campsite restaurant, “Ma Cantine Ardéchoise“, is the preferred meeting place for those fond of food! 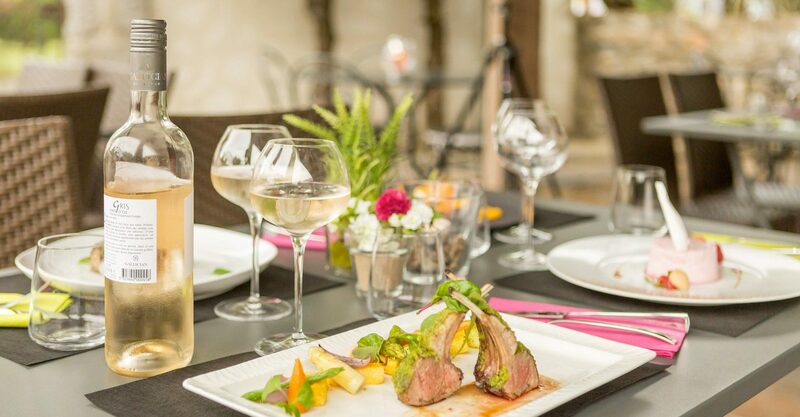 Discover our restaurant Ma Cantine Ardéchoise SPRING Menu now! From the most traditional to the most original, we have selected the best pizzas for you! 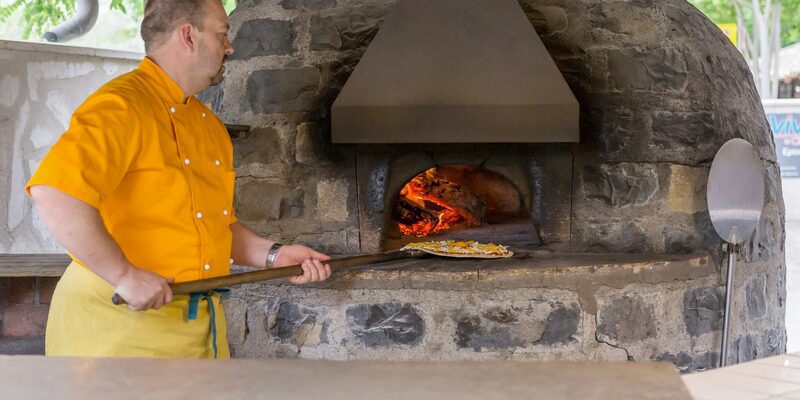 However, we can only advise you to test the emblem of our 5-star Ardèche campsite: the Pizza Soleil Vivarais! Please order at the snack bar or at the restaurant “Ma Cantine Ardéchoise” in the “La Rivière” area. 'The Chill" located by the swimming pool, the snack bar is the ideal place for your little ones! They’ll love coming here to eat a snack and a gorgeous ice cream during the hot summer days. Adults can also find something to delight them there. Are you just a little hungry? Choose between hamburgers, paninis, mixed salads and other offerings…for your meal on-site or to take away. The shaded terrace is particularly delightful to enjoy a meal in absolute peace before returning to the swimming pool. Whilst you eat, your little ones can have fun on the playground located right next to it. With the swimming pool on the right, the playground on the left and a delicious snack on your table. This is what awaits you at the Soleil Vivarais snack bar! Discover our restaurant Le Chill SUMMER Menu now! At happy hour, come and have a cool drink around the table with friends or family! 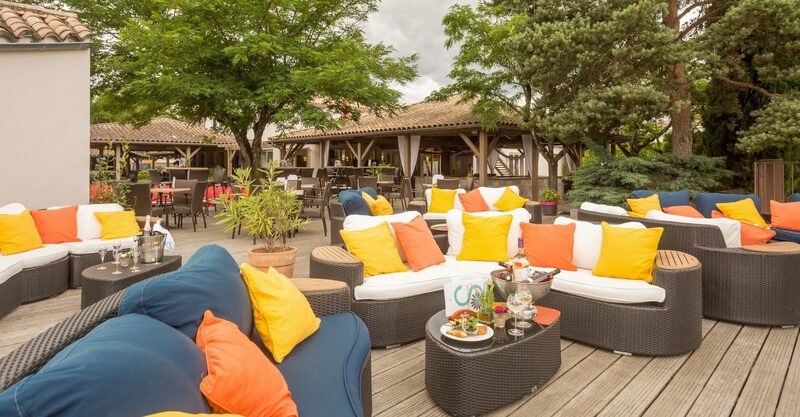 On the terrace or in the restaurant, the atmosphere is intended to be relaxed and convivial! In the morning, come and eat breakfast in the open air! The bar also offers you the option of buying takeaway pizzas and chips. Ideal for your midday or evening meal. For those most fond of their food, there is an ice-cream seller amidst the covered terrace. After a lovely swim, offer your children an ice cream. They will go wild for it. Dame Blanche (vanilla ice cream and whipped cream and warm molten chocolate), Café Liégeois (a cold dessert of lightly sweetened coffee, coffee-flavoured ice cream and Chantilly cream) or cornets…it’s their choice!